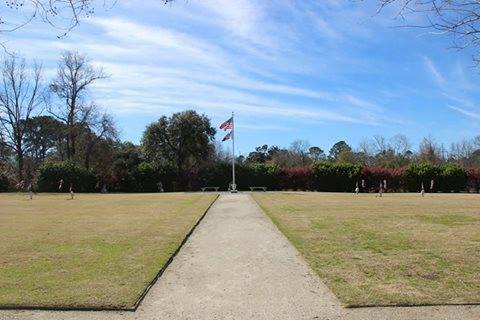 The Charleston 9 Memorial Park is located at 1807 Savannah Highway and is the former site of the Sofa Super Store. Members of the public are welcome to visit the park at any time during daylight hours. The park serves as a memorial to those 9 members who lost their lives and a place for quiet reflection. The City of Charleston continues to develop plans and establish funding to further improve the park. The land adjacent to the park was recently acquired and will become the home for CFD Station 11. Site improvements for the park will be incorporated into the construction plans for the new station. More details and conceptual plans will be posted in the future. A pathway leads from the parking area to the flagpole and plaque located in the center of the park. The 9 markers in the park represent the location of each of the fallen.